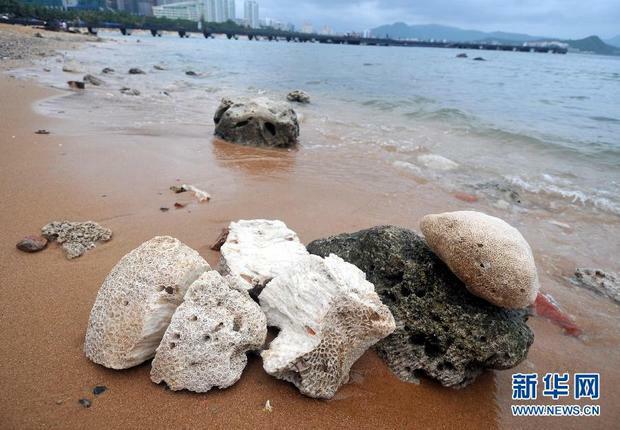 Recently, the commercial rumor of jade formed in the coral reefs has caused a wide destruction of coral reefs in Sanya, reports 0898.net. In some coral reefs reserve areas, such as Dadonghai, Xiaodonghai and West Island islands the condition of coral reefs in the shallow water regions have been severely exploited and destroyed. An anonymous fisherman told the reporters that as these coral reefs are under national protection, they have to dig them out after the low tide comes in in the evening. People, including fishermen and scuba diving coaches, are secretly blowing coral reefs apart in search of the so-called precious jade. On the West Island, the number of fishermen going farther into the sea to destroy the coral reefs for such precious jade is increasing. As the seashell fossils require thousands of years to become jade, many people believe they are precious and the trade in them can bring a lot of money. However, experts warmed that commercial rumors have led to massive damage to coral reefs. They pointed out that the possibility of jade forming in the coral reefs in Sanya is extremely small as the formation requires thousands of years of complicated changes of natural and geographical environment. Currently, relevant departments have set up investigation on the matter to attempt to stop the destruction of the reefs.